• What is the TRID rule and what does it require of creditors? o The Dodd-Frank Act required the Consumer Financial Protection Bureau to create a single set of integrated disclosure forms for mortgage loan transactions, known as TRID, to satisfy the disclosure requirements of both TILA and RESPA. The TRID forms include a loan estimate and closing disclosure. These forms were designed to be more consumer friendly, but they include sections on balloon loans and adjustable rate mortgages that may be applicable to traditional mortgage lenders, but are not relevant to charitable organizations like Habitat for Humanity. These disclosures were also designed to require software to be completed properly. • What has been the effect of TRID on charities like Habitat for Humanity? o The vast majority the more than 1,200 local Habitat organizations in all 50 states are small, community-based organizations with very small mortgage portfolios and few, if any, full-time staff. As resource-constrained charities, it can be difficult and costly to meet new regulatory requirements that are designed to ensure responsible lending practices by large financial institutions. Habitat provides homeownership opportunities to low-income families by building homes that are financed with a zero percent interest loan, or other affordable mortgage loan products. Volunteer labor and private and government funding further offset the cost of each home. Small and mid-sized Habitat organizations have experienced challenges when complying with the new TRID forms because of the cost of the necessary software to complete these forms and training required to use the software. 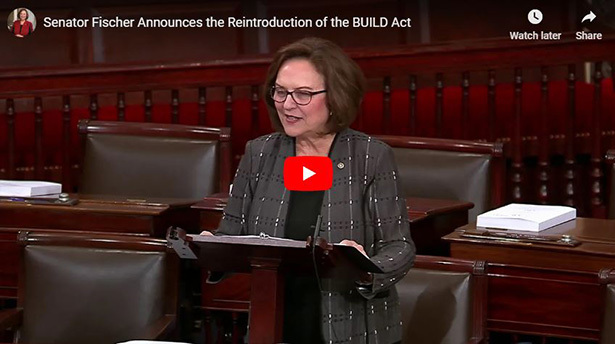 • What does the BUILD Act do? 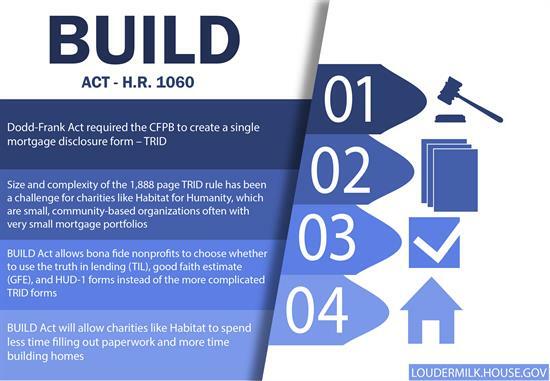 o This bill would allow bona fide nonprofits which are eligible for tax-exempt charitable donations and are making zero interest mortgage loans to choose whether to use the truth in lending (TIL), good faith estimate (GFE), and HUD-1 forms instead of the more complicated TRID forms. ▪ These are the same disclosure forms that were in place under TILA and RESPA before the new TRID forms were established by the CFPB under Dodd-Frank. ▪ Currently, all organizations making five or fewer mortgage loans in a year are not required to use the TRID forms and instead use the TIL, GFE, HUD-1 forms to ensure the material terms and costs of the loans are communicated to the borrower. This bill simply extends this option to all local Habitat organizations regardless of how many mortgage loans they are making per year. July 13, 2018 | Rep. Loudermilk (R-GA) on "Varney & Co." on the Fox Business Network discussing the calls by Democrats to abolish ICE and his bill, the BUILD Act, which aims to alleviate some of the burdens placed on nonprofits by the Dodd Frank Act.